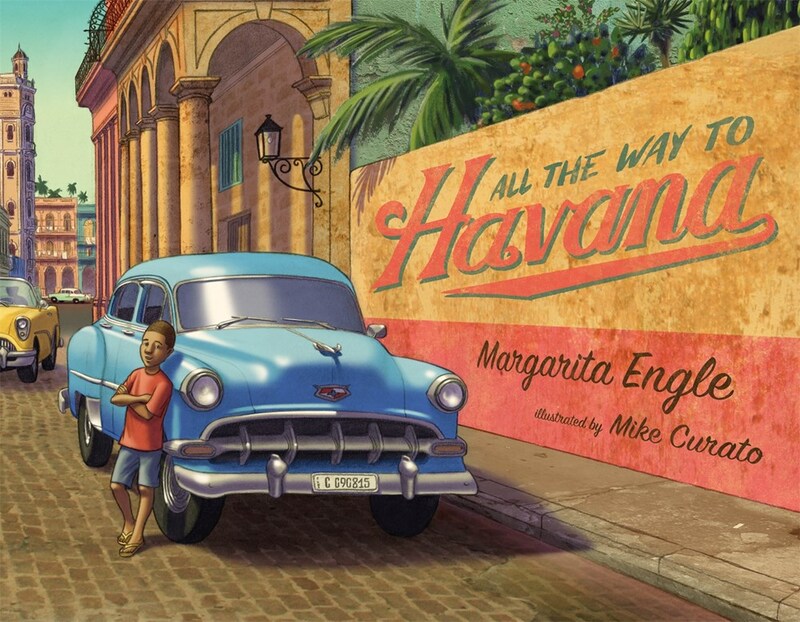 Author Margarita Engle and illustrator Mike Curato join us today to premiere the trailer for their brand new picture book, All the Way to Havana! Watch the video below, then keep reading to learn more about the inspiration behind the story. Margarita, can you tell us about the story in ALL THE WAY TO HAVANA? Margarita: All the Way to Havana can be read in a couple of different ways, depending on the age of the child. As a read-aloud for very young children, it can just be a simple family story about a road trip. Hopefully, children who are a bit older will also understand that the family keeps an old car going with constant repairs because they are poor, but perseverant. I think North American adults have a tendency to think of “classic” cars as luxury items, but in Cuba they are a symbol of poverty combined with ingenuity. Mike, we understand that you traveled to Cuba when researching the illustrations for this story. Can you share a little about your trip and how it influenced the artwork in the story? Mike: I think traveling to Cuba made all the difference for me. While Margarita is Cuban and spent much of her childhood there, I came to this project with little knowledge about Cuba aside from its history with the U.S. I was able to experience this beautiful place with all of my senses to inform my vision. By meeting its people, eating its food, walking its streets, and listening to its music, I was left with a profound impression of Cuba that I tried very hard to convey in my work. Also, the ’54 Chevy that we rode in across the countryside became the model for Cara Cara, the family’s car in the story. Your use of onomatopoeia was particularly effective in bringing the sound of Cara Cara to life for us. Can you share what inspired the story’s text for you? Margarita: During the extreme poverty of the 1990s, Cuba’s old cars were often referred to as cafeteros (coffee pots) because they made noises that sounded like stovetop percolators. As time passes, fewer of the parts under the hood are original, but even with Russian or homemade parts, the cars are still noisy. I didn’t think children would know about percolators, so I chose cara cara, the Spanish cluck cluck of a hen, to convey the English concept of putt putt. In Spanish, chicks say pío pío, so that fit nicely too (but I left out the rooster, whose ki ki ri kí seemed too bold for this weary car. It was really fun to play with the read-aloud sounds! Margarita: I love all the illustrations, but I’m especially excited about the countryside, because my childhood ties to Cuba are rural, not urban. Many Cuban-Americans have memories of Havana, but my fondest memories are of Trinidad and a nearby farm. Now, every time I visit Cuba as an adult, I always try to see farms and wild areas, even though my own family lost its farm during the land reforms of the 1960s. Mike: While this book explores ways that Cuba is different from the U.S., I think there are many aspects of it that will feel very familiar to readers. A good example of this is the spread of kids crossing a side street on their way to play baseball. It’s one of those cross-cultural experiences that I hope American kids will connect with. Margarita: I would like children to know that I wrote this book in honor of the resilience and perseverance of poor people everywhere, not just Cubans. If a child is embarrassed by the family car or any other possession, they might feel encouraged by knowing that I, for one, admire their parents for keeping those things running by being persistent and resourceful. Mike: When I was a kid, I was obsessed with cars, especially antique ones. This project was special for me because I felt like a kid again drawing cars all day. As a little treat for my fellow classic car enthusiasts, the endpapers feature sketches of 24 cars, all labeled by year, make, and model (of course). You can find some of these throughout the book illustrated in greater detail. ¡Buen viaje! Thanks for sharing the book trailer for ALL THE WAY TO HAVANA with all of us! All the Way to Havana will be on sale from Henry Holt and Co. beginning August 29, 2017. Margarita Engle is the national Young People’s Poet Laureate, and the first Latino to receive that honor. 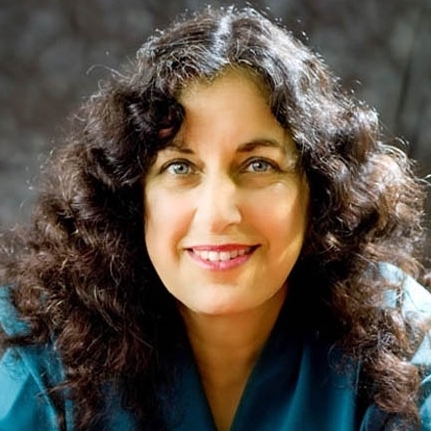 She is the Cuban-American author of many verse novels, including The Surrender Tree, a Newbery Honor winner, and The Lightning Dreamer, a PEN USA Award winner. Her verse memoir, Enchanted Air, received the Pura Belpré Award, Golden Kite Award, Walter Dean Myers Honor, and Lee Bennett Hopkins Poetry Award, among others. Drum Dream Girl received the Charlotte Zolotow Award for best picture book text. Mike loves drawing and writing almost as much as he loves cupcakes and ice cream (and that’s a LOT!). 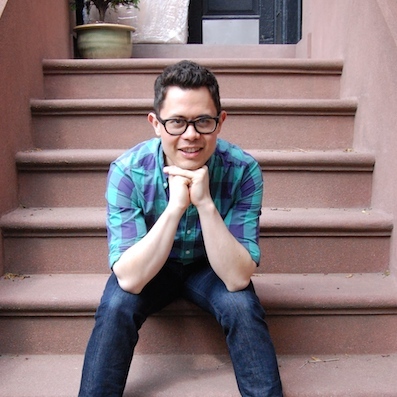 He is the author and illustrator of everyone’s favorite polka-dotted elephant, Little Elliot. His debut title, Little Elliot, Big City (Henry Holt Books for Young Readers, Macmillan), released in 2014 to critical acclaim, has won several awards, and is being translated into over ten languages. There are now four books in the Little Elliot series: Little Elliot, Big City; Little Elliot, Big Family; Little Elliot, Big Fun; and, coming in 2017, Little Elliot, Fall Friends. Meanwhile, Mike had the pleasure of illustrating Worm Loves Worm by J.J. Austrian, which has also received rave reviews. He also illustrated All the Way to Havana by Margarita Engle, and contributed to What’s Your Favorite Color? by Eric Carle and Friends, which will also be released in 2017. He is working on several other projects, including a picture book by Samantha Berger and his first graphic novel. Publishers Weekly named Mike a “Fall 2014 Flying Start.” In the same year he won the Society of Illustrators Original Art Show Founder’s Award. What a treat to watch this trailer. The illustrations are magnificent. Can’the wait to get my signed copy from Margarita.